May 4, 2019 from 8:00 am to 1:00 pm; once a year the National Park Service closes 8 miles of the Colonial Parkway to vehicular traffic for half the day. If you are traveling to Williamsburg for this event, why not make it a cycling weekend. There are many great cycling opportunities in Williamsburg for both on- and off-road cycling. Here are six options to help make it a weekend! Incorporate Pedal the Parkway into a longer Saturday ride. If you start at Jamestown Settlement and ride the Colonial Parkway to Williamsburg and back, you can then connect to the Virginia Capital Trail and ride to Chickahominy Riverfront Park and back for a 31-mile car-free ride. Free refreshments are available at the Archer’s Hope Rest Stop on the Colonial Parkway from 8 AM to 1 PM, and refreshments may be purchased at Spoke & Art on the Virginia Capital Trail on the way to Chickahominy Riverfront Park. At the end of the ride, you can purchase food and drink at Billsburg Brewery across the street from Jamestown Settlement. Here is the map and cue sheet for the “Pedal the Parkway – Virginia Capital Trail Loop”, or you can use RideWithGPS. Williamsburg Explorer – 15 miles. This route starts at the Williamsburg Municipal Building, 401 Lafayette Street, Williamsburg, VA) and takes you through some of the City’s old and new residential neighborhoods, the College of William & Mary, and visits two City parks. College Landing Park was one of the two colonial ports for Williamsburg, and Redoubt Park was the location of Redoubt #1 of Williamsburg’s Civil War defensive line. Here is the map and cue sheet for this ride, or you can use RideWithGPS. This route starts at the Williamsburg Municipal Building (401 Lafayette Street, Williamsburg, VA) and takes you from Williamsburg to Jamestown Island for the seven-mile Jamestown Island loop. Jamestown Island is a National Park Service fee area, and you can purchase a ticket at the Jamestown Island Visitor Center. From Jamestown Island, you take the Colonial Parkway back towards town, and exit the Parkway on a connector trail to Treasure Island Road, which goes past the Williamsburg Winery where you can have lunch at the Gabriel Archer Tavern. Here is the map and cue sheet for this ride, or you can use RideWithGPS. This route starts at the Yorktown Battlefield Visitor Center (1000 Colonial Parkway, Yorktown, VA) and traverses Yorktown’s Revolutionary War battlefield. The Yorktown Battlefield is a National Park Service fee area, and you can purchase a ticket at the Yorktown Battlefield Visitor Center. If you do this ride, we recommend viewing the exhibits at the Visitor Center first, and then riding the Battlefield roads. For lunch, there are six restaurants along the Yorktown waterfront. Here is the map and cue sheet for this ride, or you can use RideWithGPS. 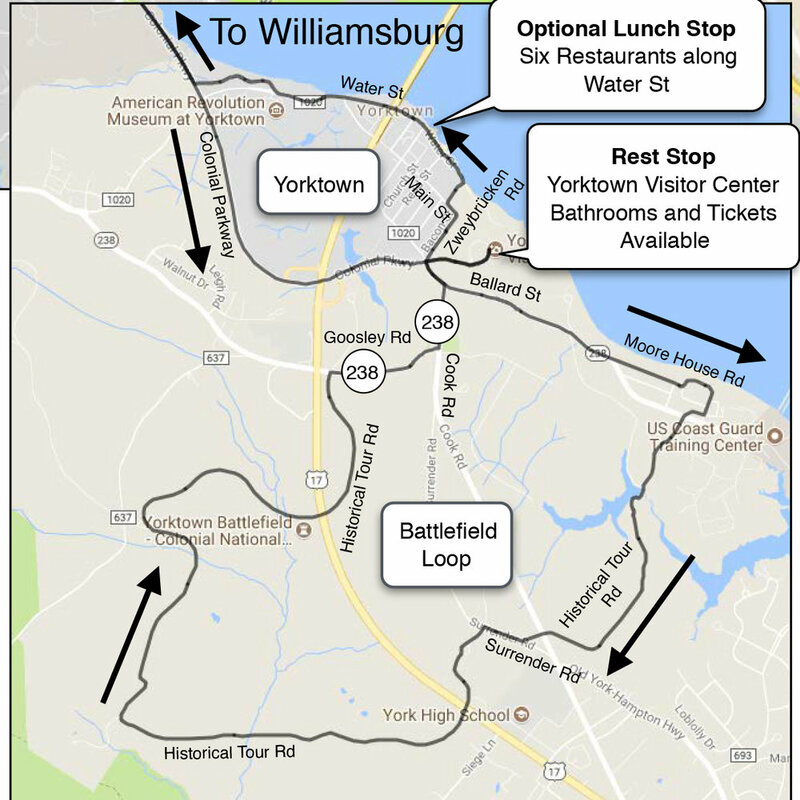 This route starts at the Williamsburg Municipal Building (401 Lafayette Street, Williamsburg, VA) and takes you from Williamsburg to Yorktown along the Colonial Parkway (which is not closed to traffic), adds the Yorktown Battlefield roads, and has an optional lunch stop at on the Yorktown waterfront before riding back to Williamsburg. The Yorktown Battlefield roads are a National Park Service fee area, and you can purchase a ticket at the Yorktown Battlefield Visitor Center. Here is the map and cue sheet for this ride, or you can use RideWithGPS. This route starts at the Jamestown Settlement Parking Lot (2110 Jamestown Rd, Williamsburg, VA). You ride your bike onto the Jamestown-Scotland Ferry and exit the Ferry in Surry County across the James River. The nice thing about taking the Ferry is that all the cars leave first, so there is no one behind you when you leave. From the Ferry you ride back roads to Chippokes Plantation State Park where you can take a rest stop at the Visitor Center and visit the Farm and Forestry Museum. From the Park, you ride through the town of Surry and then back to the Ferry. Before you reach the Ferry, you can stop for lunch at the Surry Seafood Company (633 Marina Dr, Surry, VA). Here is the map and cue sheet for this ride, or you can use RideWithGPS.